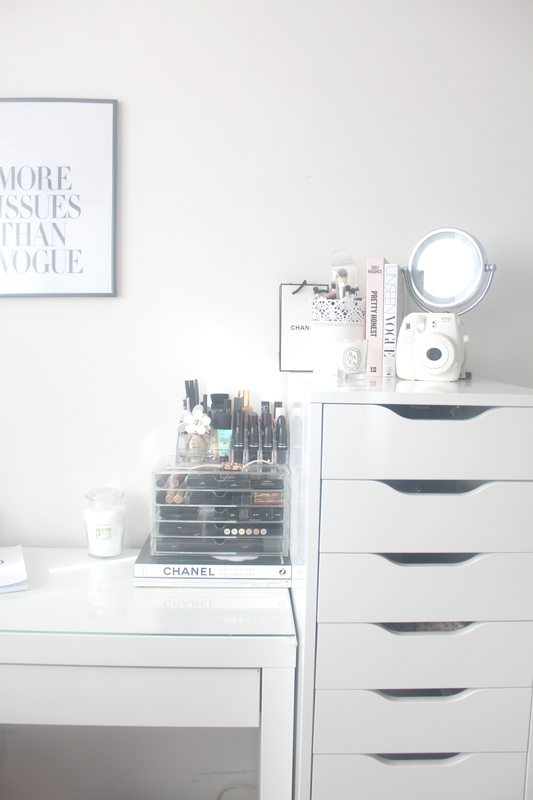 I've recently had a room makeover and as many of you have been asking where everything is from on my Instagram photos I thought it would be a good idea to do a little room tour of my new blogging space and dressing table as that part of the room is nearly finished. I'm still adding last minute touches to the rest of the room and I'm waiting on an H&M delivery to arrive so once that's all complete I will share that too. 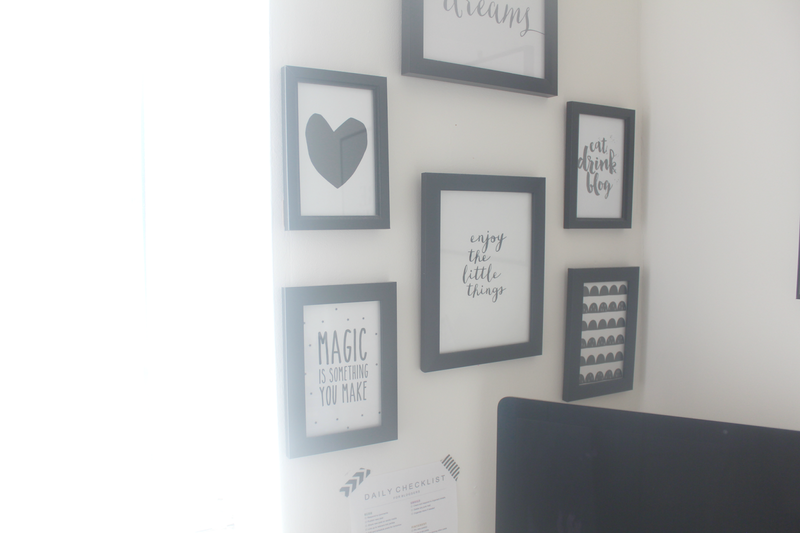 Back in September I shared with you my blogging space which I created in my bedroom, as much as I loved it, I felt that there wasn't much room as it was crammed in the corner. I've since downsized my bed and completely changed the layout of the room around to create more space to allow for a bigger desk. It took me a while to decide on a dressing table and I eventually went for the Ikea Malm dressing table as I thought it would be perfect to use as a desk/dressing table rather than just a dressing table like the Hemnes one I originally wanted to buy. I'm so glad I waited and didn't rush into buying it as I've definitely made the right decision and it was cheaper too. 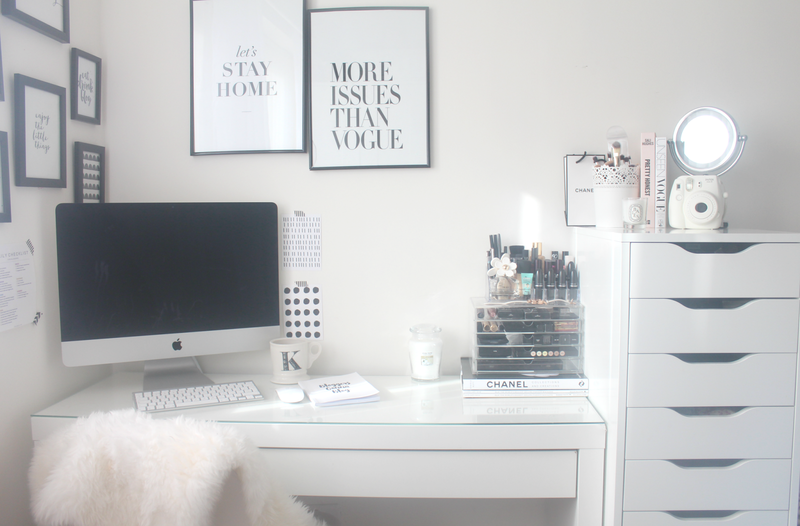 The desk is huge and there's plenty of room for my make up too. The drawer is a great size and I've bought some organisers from Amazon to arrange all of my stationary. There's also a hack where you can open the drawer bigger as it only half opens but I'm too afraid to break it as DIY isn't my thing. It's a mess at the moment so I haven't taken any photos of it but incase you were wondering the organisers I bought were these and these ones and they are the perfect size for make up or stationary. 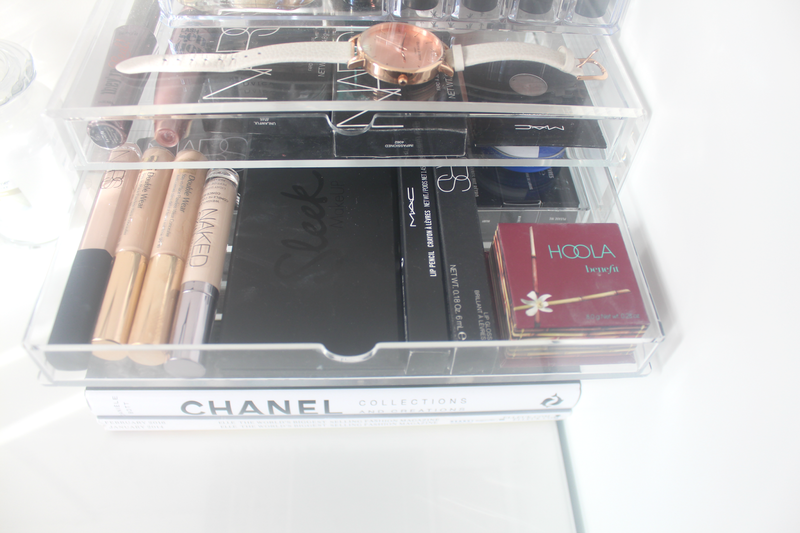 I think I will eventually use it as a make up drawer once my collection has grown. I finally bought the Alex 9 drawer unit which I have wanted to buy for a while, and I'm so glad to get my beauty and hair products organised! Previously they were all cluttered on a shelf in my old wardrobe and everything would fall out when I opened it. The Alex unit is perfect as there are 4 larger drawers at the bottom which are the perfect size for electrical products, make up bags and larger items such as body lotions. Then the 4 smaller ones I use for some of my make up, skin care, any daily products I use and jewellery. Inside isn't organised at all but I'm just thankful for somewhere to store everything at the moment! I will eventually have a sort through it and organise it properly. 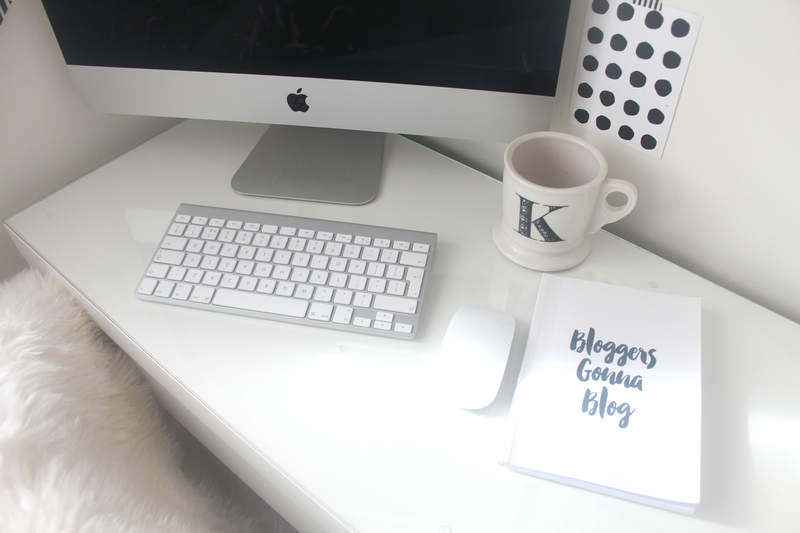 My blogging space hasn't really changed much as I already had the Eames chair and the prints on the wall but my iMac doesn't look as cluttered as it did on the small desk I had before. I had been feeling a little unmotivated the past couple of months, but I'm hoping having a new workspace will give me that little bit of inspiration to get stuck back in. I'm hoping to increase my income this year and this is the push that I needed as I do the majority of my work from home. 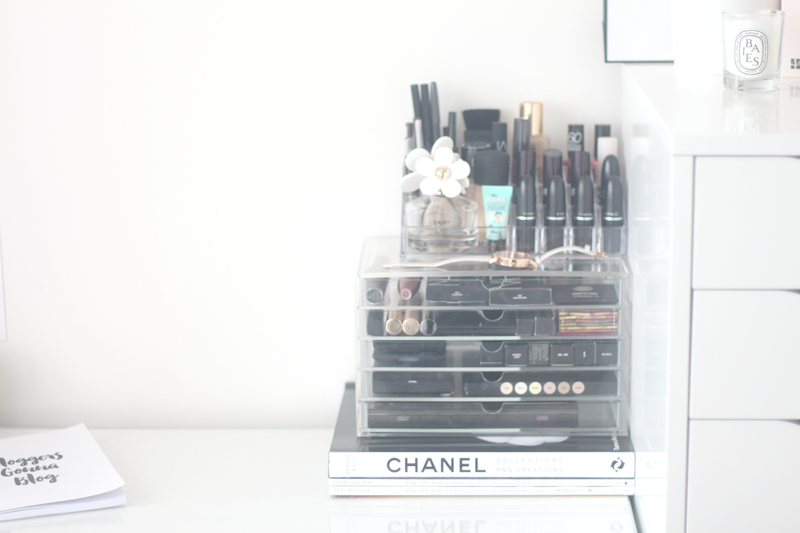 Having the bigger desk gives me somewhere to do my make up instead of sitting on the floor in front of the mirror and it means I have somewhere to display some of my make up too. 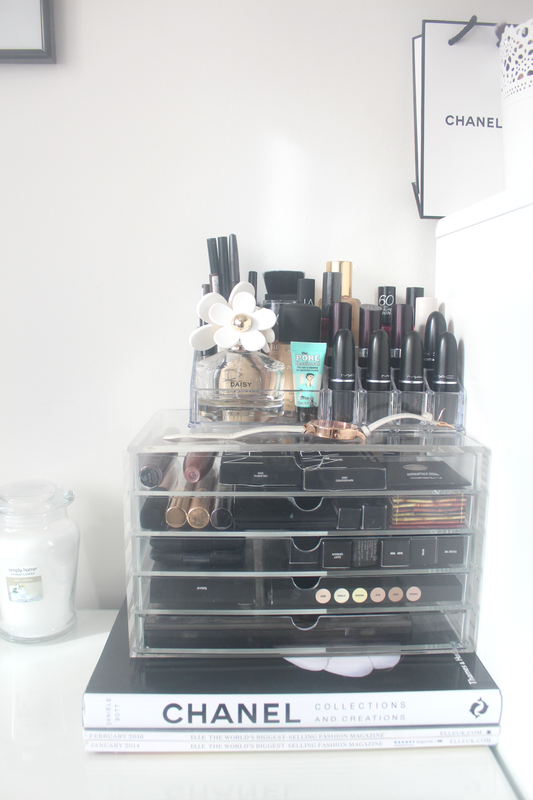 I've decided to store the products that I use the most in an acrylic tower from Muji which surprisingly holds quite a lot and then I bought a separate organiser to place on top for my lipsticks and other products. As my collection grows I think I'll buy another Muji storage box and place that next to this one as there's plenty of room. A couple of months ago I had barely any make up. I've always been a Rimmel girl and have always loved the Naked palettes but I had never bought any higher end brands until I bought a bottle of Estee double wear foundation earlier last year. Since then I've started becoming more interested in it and have ventured over to Mac, Nars and and few other brands after watching a lot of youtube videos. To some who are make up addicts it may not look like a lot of make up and to others it may look like a lot, especially as I've only bought it all in the past couple of months. But I'm really enjoying trying out new brands and may be a little obsessed now. I can't believe I was never interested in buying it before. I'm really happy with how it's looking now and glad I finally decided to re-do my room completely. In the past I've always bought a couple of bits of new furniture so my room has always been mix and match. God knows how much money I've wasted over the years, I wish I had just gone with Ikea in the first place. 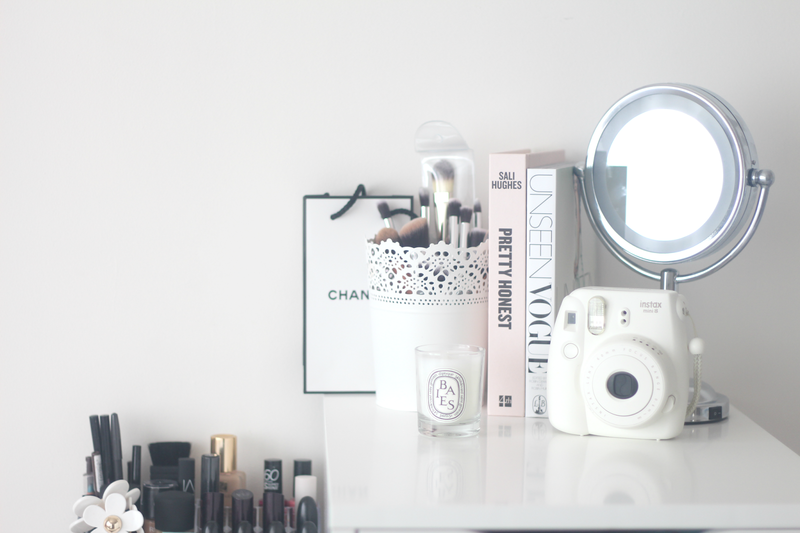 I'll most likely do an updated make up storage and dressing table post next year to show you if anything's changed as I love reading those types of posts so I'm sure many of you do too. I love having a nosy at how people do things and they often give me inspiration. 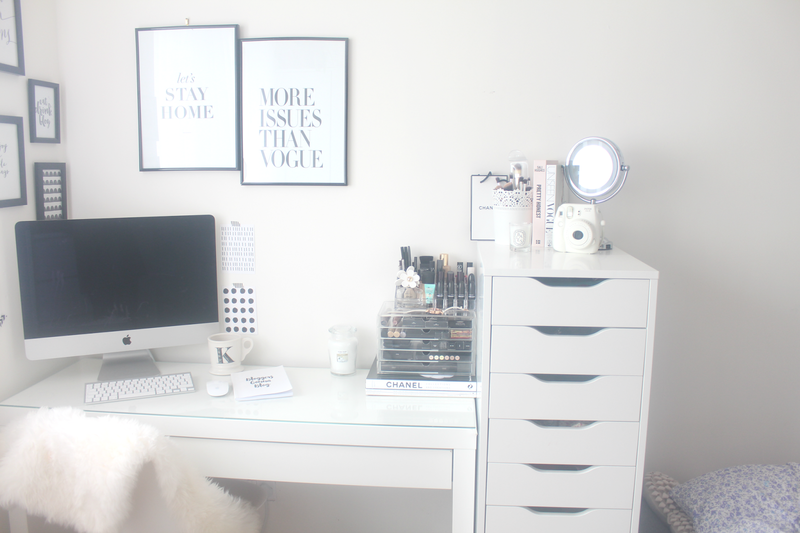 So there we have it, my current blogging space and dressing table set up. I hope you enjoyed have a look and hopefully it's given you a bit of inspiration for your own. 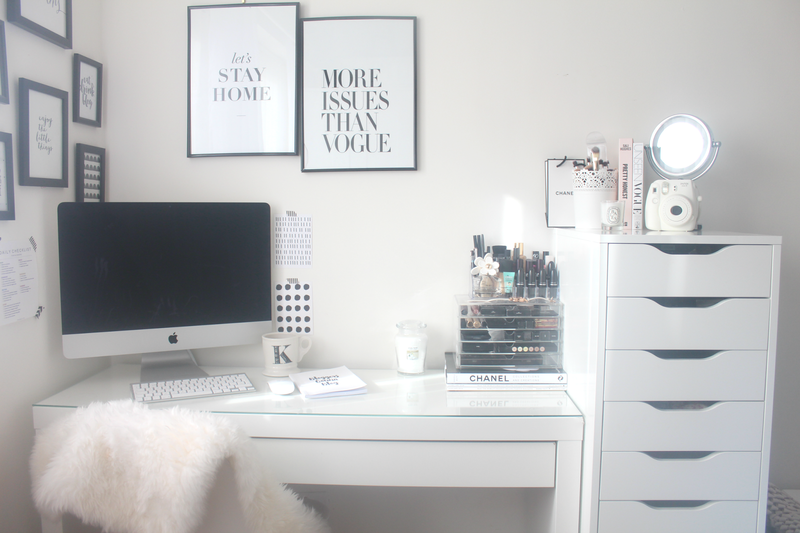 So tidy and organised, very jealous! LOve all the quotes that you have around, very motivating. I've just bought the five drawer Alex for my office, it is a great set. What a gorgeous space! I do love Ikea things, we have a lot in our home. 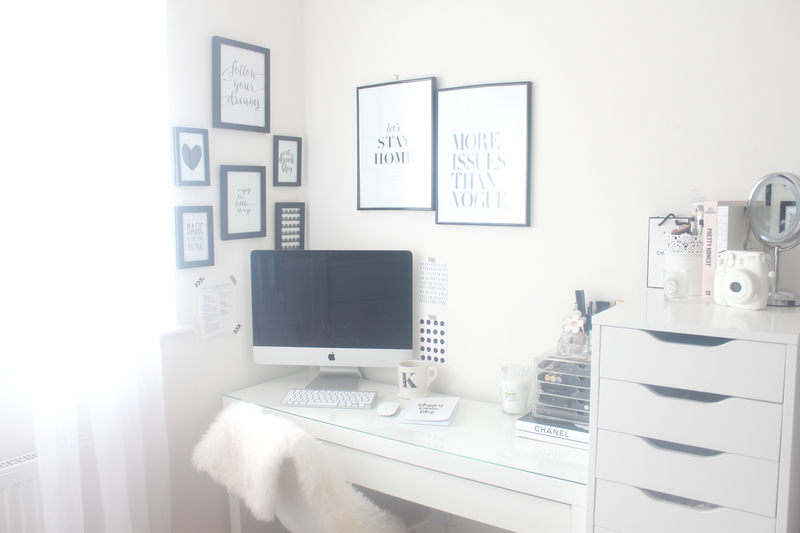 I had a new desk a couple of years back and it really inspired me creatively. I love your make up collection, I hardly wear make up but I've been thinking lately that I probably should as I get older, I always just buy the cheapest things so perhaps it's worth investing in some quality brands. 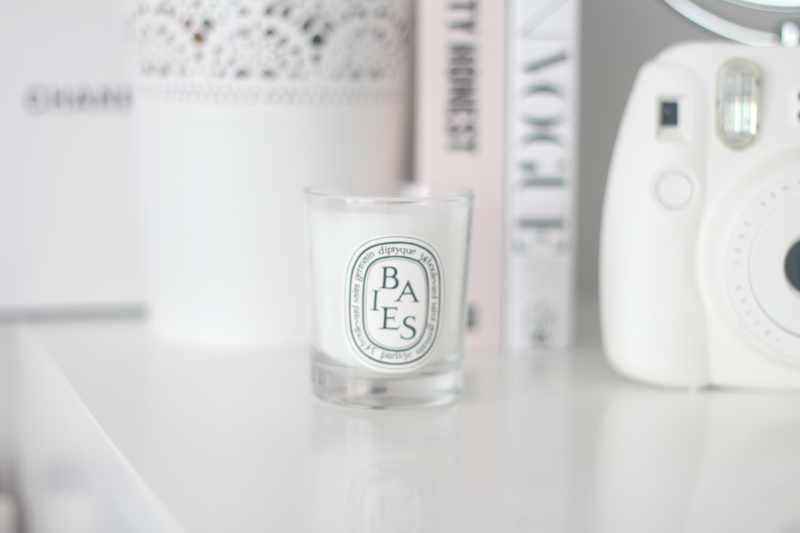 Your blog is just what I needed to stumble across as I'm moving next month, and I love your interior designs!!! I love ur blog space Kerry. I really like the look of the Alex 9 draw unit. Such a lovely space! I also almost bought the Hemnes dressing table, but as you said, the Malm one is perfect for you as a desk and dressing table. Look at all that make up! I've also recently fallen in love with MAC. No idea why I never looked into it before (probably because my closest counter is Selfridges! ), but I love it! I really like how efficiently organised everything is!